As a result of mobilizations by the MNCR, the Anastacia Network and the Public Prosecutor’s Office (MP-SP), a judicial decision ruled that the Municipality of Leme should adopt several actions to regularize the collection, sorting and processing of recyclable materials. 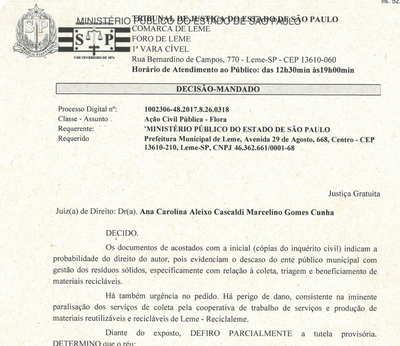 In a public civil action filed by Prosecutor Rafael de Oliveira Costa, the MP-SP argued that the Municipal Solid Waste Management Plan has not been complied with as it should. 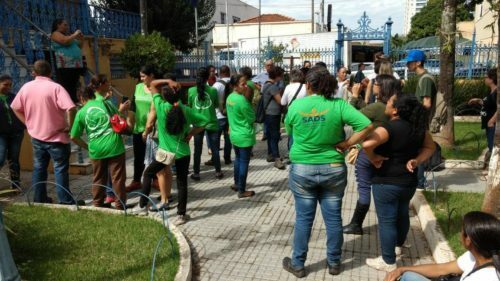 In the decision, the Municipality of Leme was ordered to promote the socio-economic inclusion of the collectors, and to supply waste picker associations and cooperatives with the means necessary to carry out waste collection, treatment and processing within 30 days. In 90 days, the municipal administration must acquire and provide vehicles to make it possible to collect all the waste generated in the municipality. Another determination obliges the Municipality of Leme to institute, in 120 days, an organic waste treatment facility, whether for composting or biogas generation, sharing the management with the waste pickers.